Nepal is a small landlocked country with an area of 147,181 square Km. Though the country is small, the population in the country is large. Nepal population is more than 29 million with the population density being 204 per km2. Thus, the large population requires many resources for their livelihood. Many of these products are imported from other countries. However, there are some multinational companies in Nepal which help to fulfil the demand of various resources. Multinational companies, as the name suggests are the companies whose ownership and control are not limited to a single country. These companies are managed in more than one place within and outside the country. The country where the company originated is the parent country, and the other countries except the parent country are subsidiaries or host countries. Distribution of goods in those countries is operated by the subsidiary companies?which has resulted in the globalisation of business. How many of your’s dream job is to work for a multinational company. 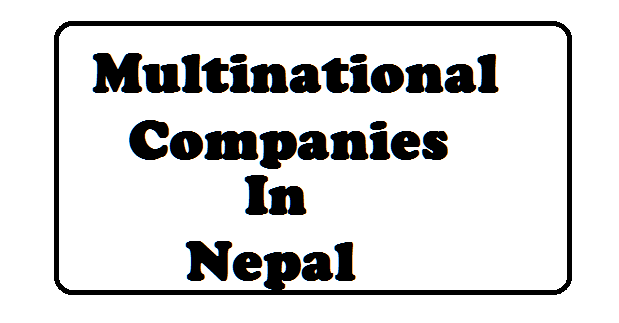 Well with increasing globalization and development there are many multinational companies located here in Nepal as well. So cheer up you have a chance to work for a multinational company and make your dreams come true. Working in a multinational company will be challenging because you will work in a more diverse and competitive environment. For those who constantly seek for growth and development in their career. Multinational company is the best. And above all you get better salary and benefits while working for multinational companies. A multinational corporation (MNC) is a corporate organization which owns and controls production of goods or services in at least one country other than its home country. To be a multinational company a business must derive more than 25 % revenue from host other countries. While it may be sound dreamy to work for multinational companies there are many issues associated with multinational companies. Since it operates in different environment there arises ethical issues, cultural conflict, labor issues and so on. One of the main reason why multinational companies shift to host countries is because of low labor wage in that country. So logically these companies pay lower wages to their labor in host country than in home country. With time, urbanisation is increasing in Nepal as well and so is the industrialisation. As such, there exist many multinational companies in Nepal as well which have been providing their services. Coca Cola is one of the must preferred brand when it comes to soft drinks. Not just in Nepal, throughout the world coca Cola has won the market. Be it sprite, Fanta or the coke itself, Coca Cola is definitely everyone’s favorite. Coca Cola is US based company now operating in all over the world except for in North Korea and Cuba. It makes Coca Cola one of the biggest multinational Companies in Nepal. And in Nepal only majority of market share is occupied by Coca Cola. It is everyone’s favorite here in Nepal. Talking about the most preferred product, the coke itself, Nepali people are addicted to it. Coca Cola generates a lot of revenue from Nepal only, even though the market is small it is profitable. Coca Cola operates in many branches in Nepal providing job opportunities to hundreds of Nepali. Recently Coca Cola has started customizing its products by leaving a space to write note for loved ones. It is one of the best marketing strategy they have adopted and has definitely proved good for their business. It is the only bottler of Coca-Cola range of products in Nepal. Coca-cola was first imported in Nepal from India in 1973. The initial local production of Coca-Cola in Nepal began in 1979. There are two bottling plants of Coca-Cola in Nepal, in Kathmandu and Bharatpur. It has acquired different market sales and distribution strategies. These strategies are customised to suit the local people’s sentiments. It is one of the leading organisations in Nepal and is promoted by The Khetan Group. It operates as a subsidiary of Coca-Cola Singapore Pte. Ltd.
Dabur is one of the biggest example of multinational product. Originally from India, Dabur has won market here in Nepal as well. Today the products of Dabur is consumed all over the world. Dabur usually produces ayurvedic products and have won hearts in terms of quality. Almost everyone in Nepal have at least once in their life used Dabur products. Dabur products ranges from medicines, skin care products, health supplements to exotic herbs. Dabur has gained this reputation with its consistent quality and authenticity. Few names that I recall while talking about Dabur are Dabur Honey, Dabur Chyawanprash, Dabur Laal tel. No matter how many products may come and go, Dabur has its own reputation that no other product can beat. With this, Dabur runs successfully in all over the world including Nepal. Dabur always uses the best marketing strategy by appointing the most celebrated faces as their brand ambassador. In india it is Mr. Amitabh Bacchhan and in Nepal it is no other than Rajesh Hamal. Unilever is another biggest multinational company operating in Nepal. It serves variety of products from health care to skin care to daily utilities. This is so obvious that you use Unilever product at least once a day. It could be your shampoo or soap or even the tooth paste you are using. Unilever is definitely the market leader in terms of these products. It is one of the oldest multinational company operating in Nepal. Unilever has expanded its branches all over the world and have gained loyal customers with their consistency and quality. It now operates in more than 50 countries all over the world including European countries and USA as well. It is the Nepali subsidiary company of Anglo-Dutch FMCG (Fast Moving Consumer Goods) Company Unilever. Its headquarter is located in Makwanpur, Nepal. This company provides products like foods, beverages, cleaning agents, personal care products of more than 400 brands. Seven out of every ten households around the world use at least one product from the brands of Unilever. Unilever has constantly been bringing new and world class products like Lux, Sunsilk, Close Up, Fair and Lovely for the Nepalese people to use in their daily lives. UNL is one of the largest personal care companies in South Asia. Axiata is a Malaysia originated telecommunications conglomerate with operations n Asia. It runs all over Asia namely in Malaysia, Indonesia, Bangladesh, Cambodia,Sri lanka and Nepal. Axiata has the highest market share in Malaysia and now is trying to win markets all over Asia. It made headlines when Axiata acquired Ncell, one of the leading telecommunications service provider in Nepal. That’s how Axiata entered Nepal and now is performing well in Nepali market as well. It aims to expand its operation all over the world but for now is only targeting Asia. Crown Plaza is one of the largest companies operating its services in hotel and resorts throughout the world. When manufacturing organization are declining these days, service oriented businesses are fluorishing. Crown Plaza is the best example of that. The company has built the largest chain of hotels and services all over the world with quality and satisfying services. In Nepal as well, Soaltee Crown Plaza situated in Kathmandu is one of the best hotels. Usually when foreign delegates and diplomats visit the country they stay in soaltee Crown Plaza. Not just in Nepal, crown Plaza has the same reputation all over the world. It operates in 52 countries and have more than 400 hotels ranging from casual hotels to five stars. Crown Plaza is one of the most successful chain of hotel business in The world. According to sources, Crown Plaza is about to open another hotel in Pokhara very soon. Chaudhary Group of companies (CG) is the biggest business house in Nepal and also a company with very good international reputation. The products of CG ranges from electronics, snacks, fast food to construction materials. It also has service based industry with many schools, colleges and restaurants. It is definitely the market leader in Nepal and now it also operates successfully in many other countries. Its leading product Wai wai noodles has second highest market share in India after maggi. It also has production plant in Singapore. CG operates all over Asia and in other parts of world as well. It is the private multinational company of Nepal founded in 1968. It is headquartered in Kathmandu, Nepal. The business interest of Chaudhary Group is multifarious and includes fast moving consumer goods, education, hospitality, energy, consumer electronics, biotech, Ayurveda, etc. It comprises 112 companies and 76 brands across the world. The present president of Chaudhary Group is Binod Chaudhary who is the only billionaire in Nepal to have been listed in Forbes magazine. One of the leading Business houses in Nepal, Khetan Group is presently led by Mr Rajendra Khetan who is also the chairman of Laxmi Bank and Primelife Insurance and the President of Nepal Britain Chamber of Commerce and Industries and Everest Insurance among others. Khetan Group has a growing list of ventures and services all over Nepal in the areas of mining, fast moving consumer goods like beverages, foodstuff and service industries like insurance, banking/ financial services, telecommunications, IT, real estate, investments, energy, etc. Sharda Group is one of the largest trading conglomerates in Nepal. It has been providing its services since 1970. After the passage of 4 decades, it has gained the name for its hard work regarding the quality of the products manufactured. Along with it, there is an excellent market network which has enabled it to spread wide. The integrity, dynamism and innovation have made the company trustworthy. It is engaged in the import and export of the wide variety of products like Copper and Brass Scrap, Zinc Ingot, Zinc Dross, M.S. Plates to rice, silk, betel nuts, food products and other miscellaneous items.